LIKE: Solid hardware. Good call quality. AR effects are fun. DON'T LIKE: Facebook's privacy track record. 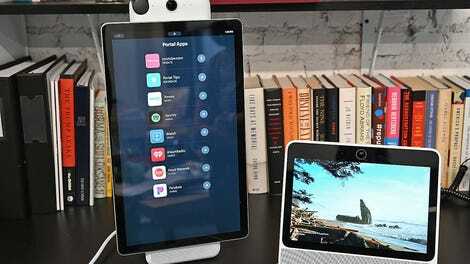 The regular Portal resembles both the Echo Show and Google Home Hub, with an added speaker grille at the bottom. The Portal+ sort of looks like a tower with a camera up top and rotatable iPad glued onto it. 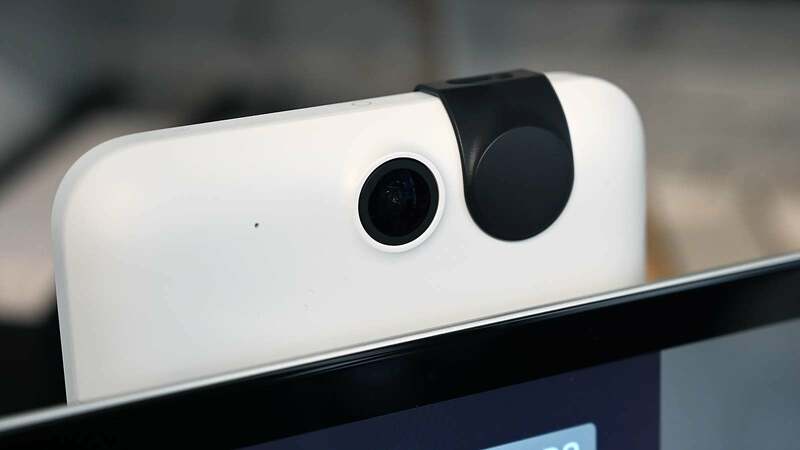 Of the two, the Portal is the more affordable option at $199 (£156) and has a 10.1-inch 720p screen, as well a 12-MP camera with a 140-degree field of view. The Portal+ costs $249 (£274), and is considerably bigger with a 15.6-inch 1080p display. It’s got the same camera, but given its larger size, it has room for more powerful speakers than the regular Portal. Both Portals look appropriately sleek for a device meant to be on display in your home, though the Portal+ takes up an obnoxious amount of space. It’s 17.7-inches-tall, and there’s just no way it won’t dominate a room. You can’t really stick it on a bookshelf, nightstand, or worktop without displacing something a bit more important. Plus, in landscape mode, it takes up just about as much space as a 15-inch laptop on a stand. The Portal is way more reasonable and fits well in a kitchen or atop a living room console. 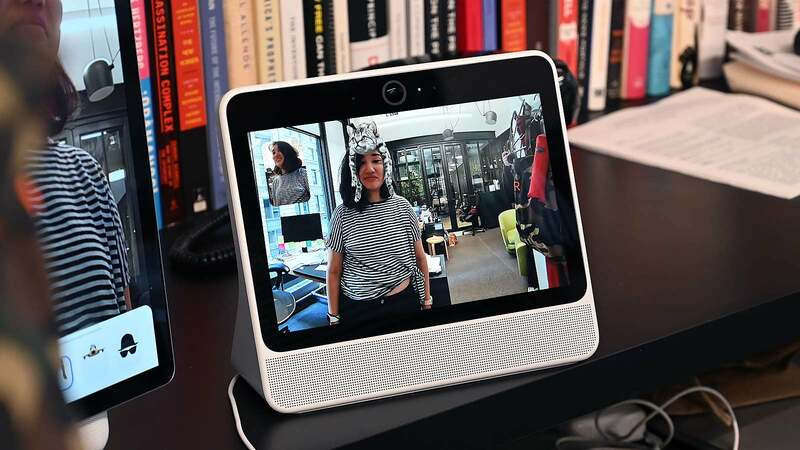 But aside from video calling, there’s just not much else the Portal can do. Its app offering is thin—you get Facebook Watch, iHeartRadio, Food Network, Newsy, Pandora, Spotify, and YouTube. No Netflix or other video entertainment that would make use of the displays. No browser to surf the web. When you’re not on calls, you can use the Portal’s Superframe feature. 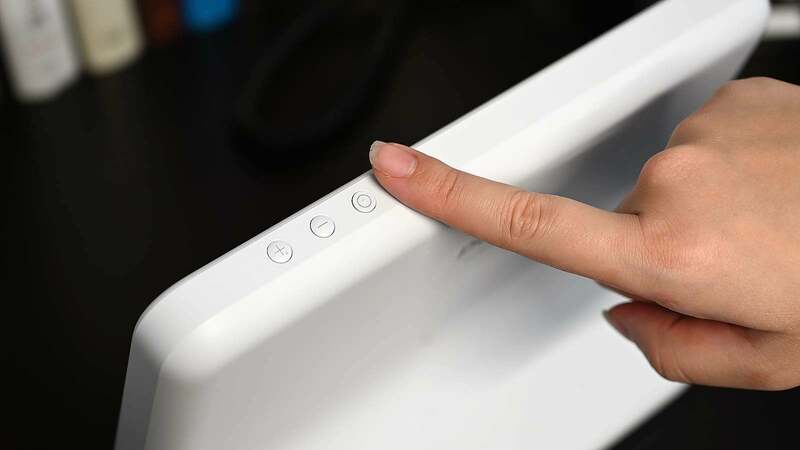 This turns the Portal into a sort of digital picture frame using photos you’ve uploaded onto the social network. Amazon Alexa is built in, and while I successfully turned off my lights with it, it’s not a compelling reason to buy the Portal when an Echo Dot will do the same for £50. Because you can’t really do anything else, Facebook has tacked on as many special features to video calls as it can. Gizmodo's Alex Cranz and I got real dorky with Snapchat-esque AR effects ranging from cats and talking dogs, to dancing strawberries and werewolf masks. If you want to listen to Ariana Grande’s “thank u, next” while complaining about exes with a friend, you can also share songs mid-call via Spotify—provided you both have Portals and premium accounts. There’s also a Story Time mode. Once I enter this mode, I can tell the person I’m calling a bedtime story. On my screen, I’ll see a script for a reimagined children’s classic, like the Itsy Bitsy Spider or The Three Little Pigs. The person I’m calling will see me interacting with the story with animated characters and AR effects. I tried this with my partner, and when it was over, he said I was lucky he didn’t dump me on the spot. But even for the target audience, there’s a lot of hurdles to using the Portal. First off, you need a Facebook account to use Portal at all. And while a good number of tech-savvy parents and grandparents are now on the platform, there are a tonne who aren’t. My mum, for instance, is paranoid about data privacy and avoids all social media—FaceTime is her video-calling app of choice because it doesn’t really require her to do much. As a potential workaround, you could give a tech-challenged parent your account credentials. I logged into both Portals and tested calling myself, so it does work. But then if you’re not careful, you could accidentally give grandma access to those Facebook photos where you got way too drunk thanks to the Superframe feature. Children’s privacy is another issue. You can enable a passcode to lock the Portal, but it’s really not hard for kids to figure that stuff out. It’s intended for young kids to use their parents’ accounts when talking to grandparents, and when I asked, Facebook emphasised you have to be at least 13 to have an individual account. These would appear to be reasonable safeguards, if Facebook’s track record with data this past year wasn’t so abysmal. Paradoxically, perhaps Facebook’s attempt at transparency is driving this discomfort. Knowing and seeing all the ways Facebook can access my data makes me think twice about how I use the Portal. I have an Amazon Echo Spot and an Echo Dot. I know those gadgets are always listening, and yeah, it does freak me out when Alexa responds to my TV or says something out of the blue. And yet, these devices aren’t constantly throwing the entirety of my social network and my photos into my face. 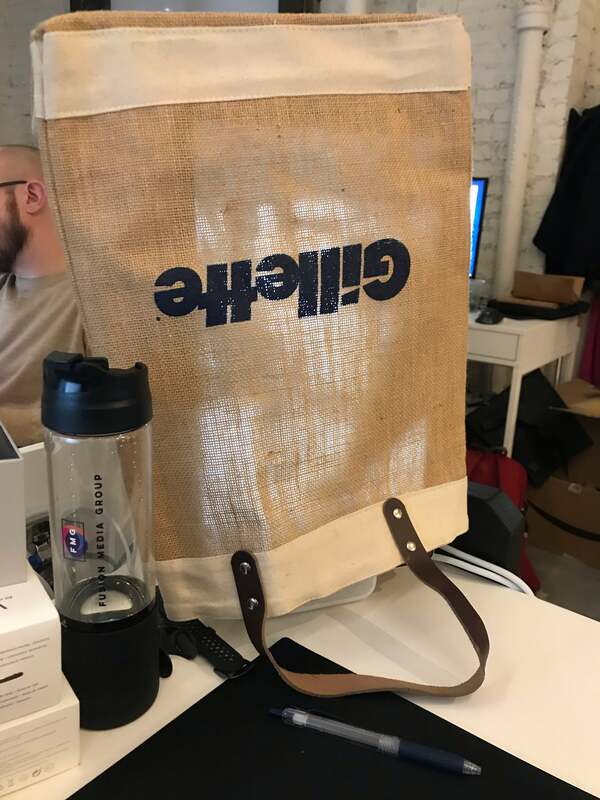 Amazon’s evils are a Google search away, but it’s not quite so ingrained into my connections with others. If my Amazon data leaks, it’s probably my passwords, credit cards, or info about what I’m buying. 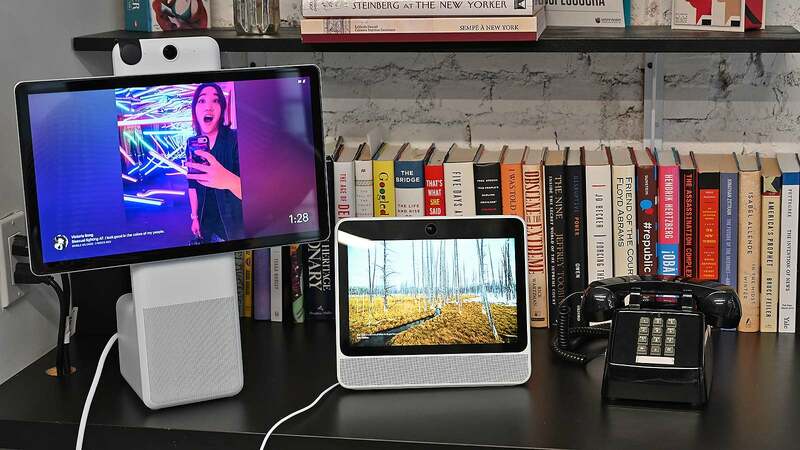 The Google Home Hub can’t even do video calls. Even if Facebook says it won’t listen to my calls, the idea it could feels like inviting it to my most intimate moments and memories. That’s a potential violation that feels way more personal. So, would I drop $200-$350 to invite Facebook into my home? Nah. I think I’ll stick to my phone. I know it’s not any safer or more private, but at least I get to keep the illusion that it is.